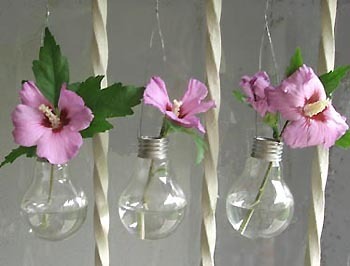 Upcycled lightbulb vases from esprit cabane via curbly. Scroll down for salt and pepper shakers, as well. Too cute. This entry was posted on Monday, April 27, 2009 at 5:05 pm and is filed under Upcycling. You can follow any responses to this entry through the RSS 2.0 feed. You can leave a response, or trackback from your own site. This is really cool. I follow a lot of dumpster diving fans and some of the photos you post here are definitely the most creative. Kudos. Have you read about decorative dumpster day, Chris? I read something briefly on it but kind of in a hurry. What am I missing? On May 1st, we are posting photos of decorated dumpsters and asking other blogs to do the same and to link back. Alternatively, send photos of decorated dumpsters and we will publish them here.